SEATTLE (Aug. 13, 2018) — A court ruling forcing the Environmental Protection Agency to ban a pesticide linked to brain damage in children was just one of many legal actions seeking to force the agency to do its job. The EPA had concluded in 2016 that the use of chlorpyrifos on food must be banned. But last year, the agency put the ban on hold until at least 2022, saying more study was needed. According to Miriam Rotkin-Ellman, senior scientist at the Natural Resources Defense Council, the lawsuit that brought about that ruling was just one of more than 100 that have been filed against the Trump administration over environmental issues in a little more than a year-and-a-half. “We’re talking about rollbacks or refusal to do their job in the areas of clean air, clean water, the pesticides that are used in the fields and end up in our food supply and the chemicals used in our homes,” Rotkin-Ellman said. Opponents of the chlorpyrifos ban point out that it was approved by the EPA in 1965 and has passed strict federal pesticide safety standards several times since. 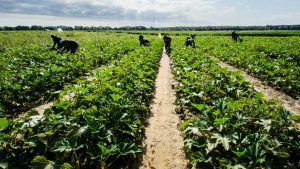 But Rotkin-Ellman said the most recent studies have found that the pesticide is not only acutely toxic to farmworkers, but that prenatal and early childhood exposure causes damage, including reduced IQ, loss of working memory and delayed motor development. She added that chlorpyrifos was banned for home use almost 20 years ago. Chlorpyrifos is used extensively on apples, oranges, broccoli and dozens of other crops. Rotkin-Ellman noted that farmworkers, who have the most direct exposure, have been fighting for decades to have it banned for agricultural use. The Federal Court of Appeals for the 9th Circuit has given the EPA 60 days to enact the ban.